Lincoln County in southern Mississippi was formed in 1870, during the brief period of Republican Reconstruction, and was named after Abraham Lincoln. Brookhaven serves as the county seat, and smaller communities include Ruth, East Lincoln, Auburn, and Bogue Chitto. In the 1870 census, Lincoln had a population of 10,184, a number that grew to 13,547 (including 7,701 whites) ten years later. Lincoln’s farmers grew relatively small amounts of cotton and ranked in the bottom quarter in most areas of farm production but had Mississippi’s eighth-largest rice harvest. Landowners cultivated about 63 percent of Lincoln County’s farms. In 1880 Lincoln had a small but growing manufacturing industry, with twenty-five establishments employing 132 workers. The county ranked ninth in the value of manufactured goods produced. In 1900 Lincoln had a population of 21,552. The county’s eighty-nine manufacturing establishments employed 997 workers, nearly all of them men working in the timber industry. As in most of Mississippi, far more white farmers (72 percent) owned their land than did African American farmers (44 percent). About half of the thirteen thousand Lincoln County churchgoers recorded in the 1916 religious census were Southern Baptists. The rest belonged to churches of the National Baptist Convention and the Methodist Episcopal Church, South, with the African Methodist Episcopal Church, Methodist Episcopal Church, and Church of Christ each having about six hundred members. Lincoln County had the state’s second-highest Church of Christ membership. Constructed in 1896, Brookhaven’s Temple B’nai Sholom served the area’s Jewish residents until 2009. 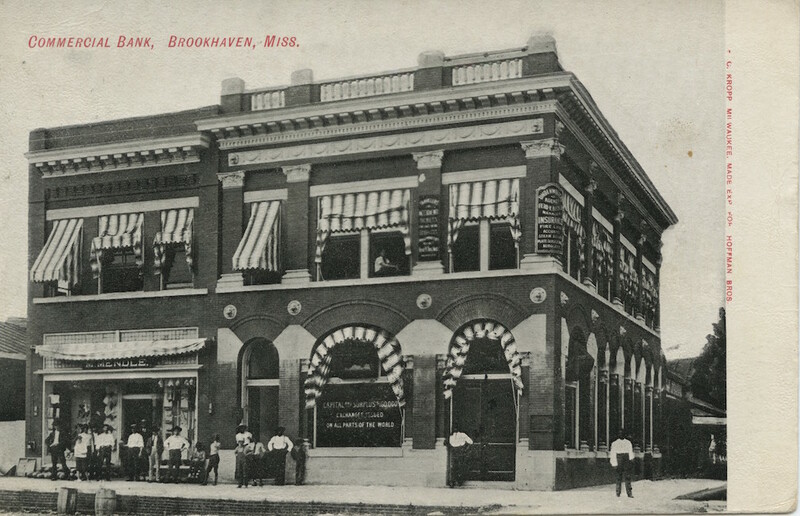 Brookhaven has a long history as an educational center. Methodists established Whitworth College in 1859, and it continued to teach Mississippi women until 1964. Annie Coleman Peyton graduated from Whitworth in 1872 and taught there briefly before working for the establishment of Mississippi Industrial Institute and College (now Mississippi University for Women) in Columbus, the state’s first public college for women. Susie Powell spent her childhood in Brookhaven and attended Whitworth College before going on to a career in home demonstration work. Through Powell’s efforts at Whitworth, Lincoln County became home to Mississippi’s first canning clubs. Copiah-Lincoln Community College was founded in 1928. Today, Lincoln is home to the Mississippi School for the Arts, which moved into the buildings on the old Whitworth campus. Brookhaven has also produced several important writers. Author and artist Charles Henri Ford was born there in 1913, and author Martha Lacy Hall, a native of nearby Pike County, attended Whitworth College. Brookhaven’s Cid Ricketts Sumner, born in 1890, was a popular mid-twentieth-century author whose novels became the basis for the movies Pinky (1949) and Tammy and the Bachelor (1957). By 1930 Lincoln had a population of 26,357 (including 36 natives of Italy) and was 64 percent white. About five thousand Lincoln County residents lived in the growing city of Brookhaven, and almost a thousand people worked in industry. Still, farming dominated, with thirty-six hundred farms divided evenly between owners and tenants. The county’s farmers grew considerably more corn than cotton or other crops. In 1960 Lincoln’s population remained virtually unchanged, though the percentage of African Americans had dropped from 36 to 31. At least two important figures in Mississippi’s civil rights struggle and its opposition were Lincoln County natives. Hollis Watkins grew up on a farm on the edge of Lincoln and Pike Counties before becoming an activist in McComb as a teenager and then going on to work for numerous civil rights causes. Judge Tom Brady gained fame as the author of a short publication, Black Monday, a condemnation of the 1954 Brown v. Board of Education decision primarily on constitutional grounds. As in many southern Mississippi counties, Lincoln County’s 2010 population remained predominantly white and had grown over the last half of the twentieth century, gaining more than eight thousand people since 1960. Among Lincoln’s 34,869 residents, 68.4 percent were whites and 30 percent were African Americans.